The Luxury Sunset Sailing Tour takes you on a romantic tour onboard a luxury yacht that will take you along beautiful Banderas Bay. Admire the sunset during an unforgettable experience on your next vacation in Puerto Vallarta. On the tour you'll pass very close to the boardwalk, where you'll be able to see picturesque views of the old town part of Puerto Vallarta. You'll also be able to take stunning photos of the spectacular sunset in the region, as well as beautiful Puerto Vallarta in the moonlight. The exclusive yacht is very comfortable and allows you to lie back on a lush cushion as you look at the endless stars lighting up the sky and listen to the soft breeze and the movement of the ocean beside you. 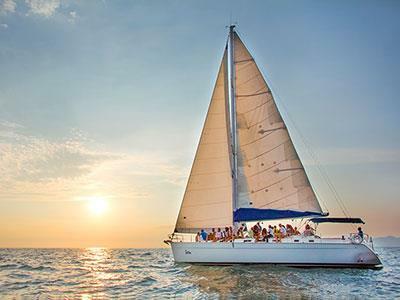 Experience something romantic and exclusive during your visit to Puerto Vallarta when you book the Luxury Sunset Sailing Tour!